I know it has been a few weeks since the Time Magazine "Are you mom enough" cover hit the news stands...... and I wanted to have my say on the issue. But I just could not find the right words to say. That is until earlier this week when I took this Foto of Kit Kat nursing. She is just shy of 31 months of breastfeeding and I am OKAY with that. You see, she only nurses once a day, on one side. First thing in the morning, she "eats" and that is it. No harm done, no one calling foul, no one battling it out to see how is best. I am not striving for the Mummie of the Year Award. This foto....... she told me I am mom enough. 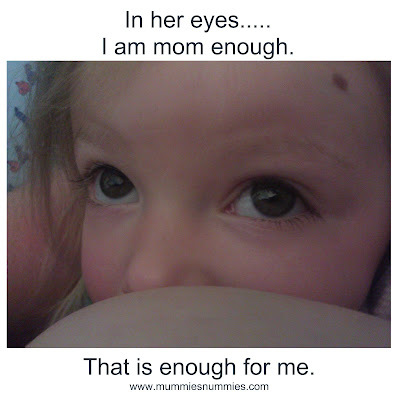 I am mom enough for her. So take that Time Magazine!